...The spell in Cyprus is not solely about testing the air crews and their cutting-edge jets in clear, less-cluttered skies. Testing will also include some live firing. The deployment will also train and test all aspects of moving the F-35 aircraft to a new location – including all the logistic support, maintenance, and personnel required to get the Lightning off the ground. ...Once the Mediterranean deployment is complete the Lightnings will return to Norfolk to gear up to sail with HMS Queen Elizabeth to the Eastern Seaboard of the USA in the late summer/early autumn. So far all the F-35s operating from Marham serve with the RAF’s legendary 617 Squadron – the Dambusters – although two in every five personnel on the squadron are Royal Navy. As part of the UK’s intention to buy more than 130 Lightnings, a second F-35 squadron will form next decade under Fleet Air Arm tutelage, 809 NAS." Hopefully the F-35 provides an adequate air defense umbrella,to prevent future issues similar to the Exocet strike decades ago in the Falklands war. That was a big deal, and I'm not sure the Royal Navy ever developed the necessary air defense to prevent it. Maybe Sea Harriers with better radars and AMRAAM, but even that would be somewhat hamstrung given advances in air to sear missiles. In much the same way as the USN's dilemma with Russian/Chinese carrier killer cruise missiles.. ...The Merlin HM.2 Crowsnest will use improved missions systems and hardware originally developed for the SKASaC fleet, including the distinctive “bag” radome that houses the Thales Searchwater radar and swivels down below the aircraft during flight from the port-side weapon station. The mechanically scanned radar will offer long-range air, maritime, and land detection and tracking capability, and also feature fully integrated electronic support measures. The radar and associated Cerberus mission system, also supplied by Thales, have evolved for the Merlin HM.2 to include new radar modes, as well as human-machine interface enhancements such as touchscreen technology...."
Why did they not palatalize it and hang it out the back? Without really caring about the details IIRC the BAG more or less is the same as before but upgraded inside the new helo. See previous post above last (3rd) paragraph. "Japan wants Britain to emphasise bilateral security ties by sending its newest aircraft carrier to the country as soon as possible, the South China Morning Post has learned.... It is not expected to fully enter service until next year, but Tokyo is “very keen” that its first deployment include a visit to a Japanese port, according to an official who was not authorised to speak publicly on the matter. 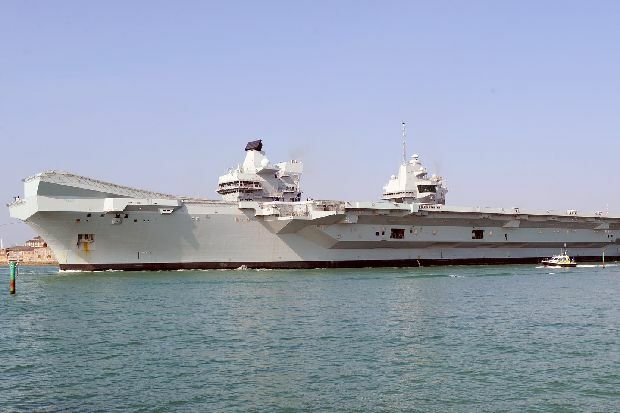 ...“If HMS Queen Elizabeth comes to the Pacific, it won’t do anything approaching what US warships have done in the South China Sea and challenge the 12-mile limit [of territorial sovereignty] around those islands. I expect it will carry out ‘innocent passage’ beyond the 12-mile limit. “But I also think that will please Japan as there is great symbolism attached to an aircraft carrier of a member of the UN Security Council and a G7 member state operating in the South China Sea and travelling on to Japan to reinforce the strategic partnership.”..."